These gauges are directly bonded (that is pasted) on the surface of the structure under study. Hence they are termed as bonded strain gauges. The sensing element is rectangular filament made as a wafer from silicon or geranium crystals. To these crystals, boron is added to get some desired properties and this process is called doping and the crystals are called doped crystals. This sensing element is attched to a plastics or stainless steel backing. Leads made of gold are drawn out from the sensing element for electrically connecting the strain gauge to a measuring instrument (wheat stone bridge). Negative or n-type (resistance decrease with respect to tensile strain). Positive or P-type ( resistance increase with respect to tensile strain). With the help of an adhesive material, the strain gauge is pasted/bonded on the structure under study. Now the structure is subjected to a force (tensile or compresive). Due to the force, the structure will change the dimension. As the strain gauge is bonded to the structure, the stain gauge will also undergo change in both in length and cross-section (that is, it strained). 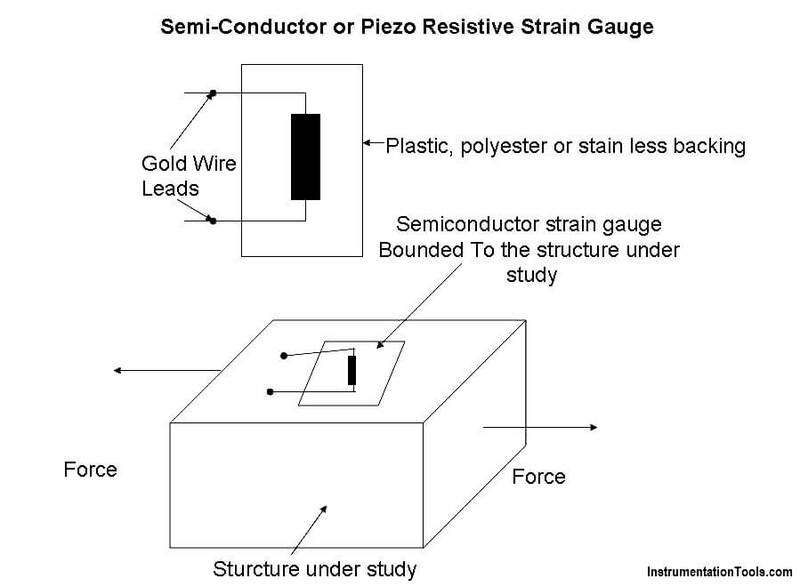 When the sensing element (crystal) of the semiconductor strain gauge is strained, its resistivity changes contributing to a change in the resistance of the strain gauge. The change in the resistance of the strain gauge is measured using a wheat stone bridge. This change in resistance of the strain gauge becomes a measure of the extent to which the structure is strained and a measure of the applied force when calibrated. These gauges have high gauge factor and hence they can measure very small strains. They can be manufactured to very small sizes. They have excellent hysteresis characteristics. They have a good frequency of response. They have good fatigue life. These gauges are brittle and hence they cannot be used for measuring large strain. The gauge factor is not constant. These gauges have poor linearity. These gauges are very costly and are difficult to be bonded onto the structure under study. These gauges are sensitive to change in temperature.